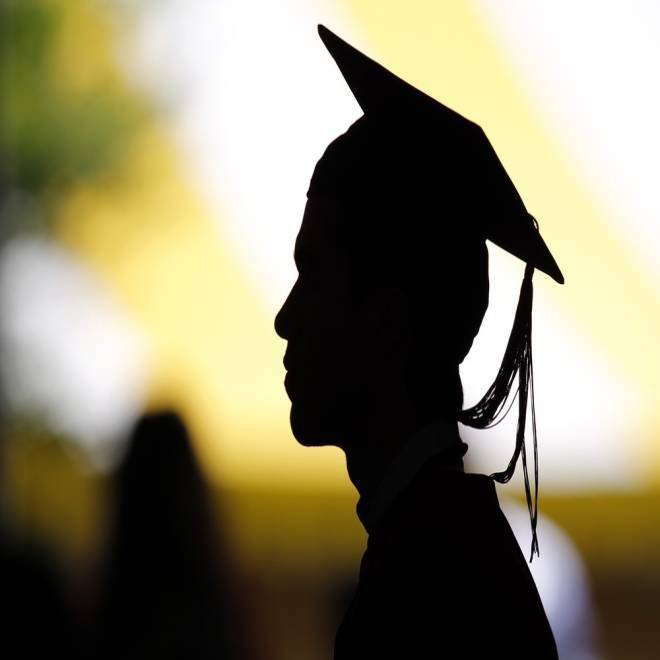 A view shows the silhouette of a student with a graduation cap as students take their seats for the diploma ceremony at Harvard University in Cambridge, Mass., in this May 24, 2012, file picture. Want a solid, middle-class salary straight out of college? Skip the last two years. A site that analyzes state-level data of how much people earn a year after graduating college found some counterintuitive results: Certain students who earn associate’s degrees can get higher salaries than graduates of four-year programs — sometimes thousands of dollars more. “These numbers and the consistency of these numbers are surprising to me,” said Mark Schneider, president of CollegeMeasures.org and a vice president at the American Institutes for Research. CollegeMeasures aggregates anonymized education and earnings data to figure out who earns what after graduation. Some of its results run counter to commonly-held assumptions. Community college degrees, long considered also-ran prizes in the race for academic achievement, “are worth a lot more than I expected and that I think other people expected,” Schneider said. But there is a catch: You have to earn your degree in a technical or occupational program to earn anywhere near $40,000. That’s the approximate average earned by students who went to school and worked in the state of Virginia and graduated with two-year degrees in these fields between 2006 and 2010. Graduates of two-year nursing programs earned am average of $45,342. Once they entered the work force, holders of what CollegeMeasures characterizes as “occupational/technical” associate’s degrees made about $6,000 a year more than people who earned associate’s degrees in non-occupational programs. Given the high demand for nurses, computer specialists, mechanical technicians and the like, that’s not unexpected. In a study published earlier this year by the Census Bureau, college graduates with science and engineering degrees were about 10 percentage points more likely to be employed full-time than the average of all graduates. The surprising finding is a comparison of those earnings to what bachelor’s degree graduates made, on average: $36,067. People with liberal arts and humanities majors didn’t even fare that well: on average, grads with political science majors earned $31,184, history majors earned $30,230 and English majors only earned $29,222 a year. "In general, majors that are linked to occupations have better employment prospects than majors focused on general skills," a report published earlier this year by Georgetown University's Center on Education and the Workforce, said. “In the U.S., we’ve tended to think that the bachelor’s degree is the only thing that matters, and this data tells us that technical degrees from community colleges are hidden gems,” he said. A generation ago, things were different. Before the recession of 1980-1981, a bachelor’s degree of any kind was a ticket to a career that offered middle-class earnings, said Anthony Carnevale, director of Georgetown's Center on Education and the Workforce. The big caveat with the impressive amounts some two-year grads can earn is that they don’t reflect lifetime earnings. In general, people with more advanced degrees still earn more over the course of their careers, Carnevale said, but there’s a growing divergence between humanities and technical-field majors when it comes to future earnings performance.